Chances are, if you’ve imported a Toyota HiAce van, you’ll be using it to transport people or goods. In both of these roles, the engine on your HiAce is going to be doing a lot of extra work—idling at stops, quick acceleration and deceleration, and carrying heavy loads. Fortunately, you bought a Toyota and, with proper maintenance, you can expect a long lifespan of at least 400,000 km. You could choose to visit a professional mechanic for maintenance, but why not learn how to change the oil of your van yourself to save money? Why is HiAce Maintenance Crucial? The key to a long lifespan is regular maintenance. Most Toyota HiAces on the road often come with the instruction to change the engine oil and filter every 10,000 km, or something to that effect. Additionally, there is an additional instruction regarding “severe service,” which refers to vehicles used for short trips, heavy loads, and regular towing. In this case, the service interval is often reduced to 5,000 km. The reason is that oil can only endure the heat for so long. It starts to burn, which is why used engine oil turns black. Eventually, the oil can no longer lubricate the engine parts properly and turns into a thick sludge of burning oil; a telltale sign being a cloud of blue smoke. If the vehicle continues to run without a proper oil change, the engine parts begin contacting each other, resulting in a seized engine and a huge repair bill. In the long run, maintenance is far cheaper than replacing expensive parts when they finally fail due to neglect. However, many people/companies that own this type of van may find that it isn’t possible to leave the vehicle at a maintenance shop for any amount of time during work hours as it is an integral part of the business—you can’t pick up and drop off passengers without a vehicle. So what can you do if you are not able to schedule minimal servicing on your Toyota HiAce? Note: These instructions, of course, can apply to any vehicle, with slight modification. Preferably, while the engine is still warm, but not immediately after heavy driving, put the vehicle in Park, or 1st Gear, and set the parking brake. Access and remove the oil fill cap. In conventional vehicles, this is under the hood. In the Toyota HiAce, this is under the driver’s seat. Take a look at your owner’s manual or ask your mechanic to show you how to get under there. Jack up the front of the vehicle using jack stands to support the vehicle under the frame. Warning: I know we’ve seen plenty of people get under the van without jack stands and come out perfectly fine. On the other hand, it’s the ones who don’t come out fine that we never see. Please, for the sake of your family, use the jack stands every time you go underneath a vehicle. Position the oil drain pan directly under the oil filter. Use the oil filter wrench to loosen the filter slowly, so as not to splash oil all over the place, especially in your face. When the oil slows to a drip from the filter, you can loosen it further, but when it’s almost off, more oil will come out. Fully remove the filter and make sure the gasket is still attached to the filter. If the gasket is stuck to the engine, remove it. You’ll probably have to move the oil drain pan to a new position to catch the used oil from the engine. 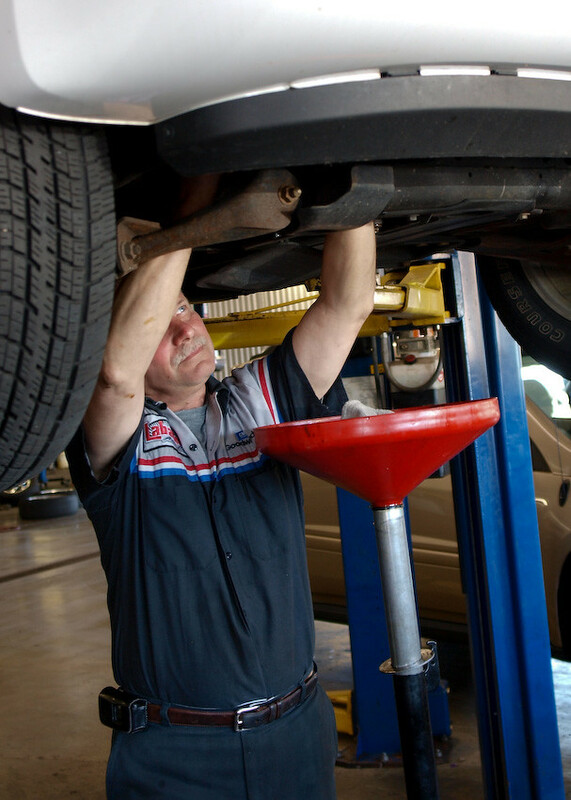 Use the wrench, not a pair of pliers or vise-grips, to loosen and remove the oil drain plug. Again, do this slowly so you don’t get splattered by hot engine oil. Remove the old drain plug gasket and discard. Using a new drain plug gasket, reinstall the drain plug finger tight. Use the wrench to tighten the drain plug only slightly, perhaps one-quarter turn to seal the gasket. Apply a small amount of new engine oil to the gasket on the new oil filter. Screw the new filter on until it is finger tight. Use the oil filter wrench to tighten the filter, an additional one-third to two-thirds of a turn, to seal the gasket. Put the oil funnel into place and add the prescribed amount of oil to the engine. This information can be learned from the owner’s manual, or if not available, by trial and error. If the latter, add just four quarts, replace the oil cap, and run the engine for about a minute while looking under the vehicle to check for leaks. If there are no leaks, shut the engine off and put the vehicle back on the ground. Remove the dipstick and wipe it clean. Put the dipstick back in the tube and pull it out again. If there is no oil on the dipstick, add a half-quart to the oil fill hole and check again in thirty seconds. If you’re doing the trial and error method, keep doing this until the oil reaches the safe region on the dipstick. Write down the final amount for future reference. Finally, run the engine again for about five minutes to check for leaks under the vehicle.